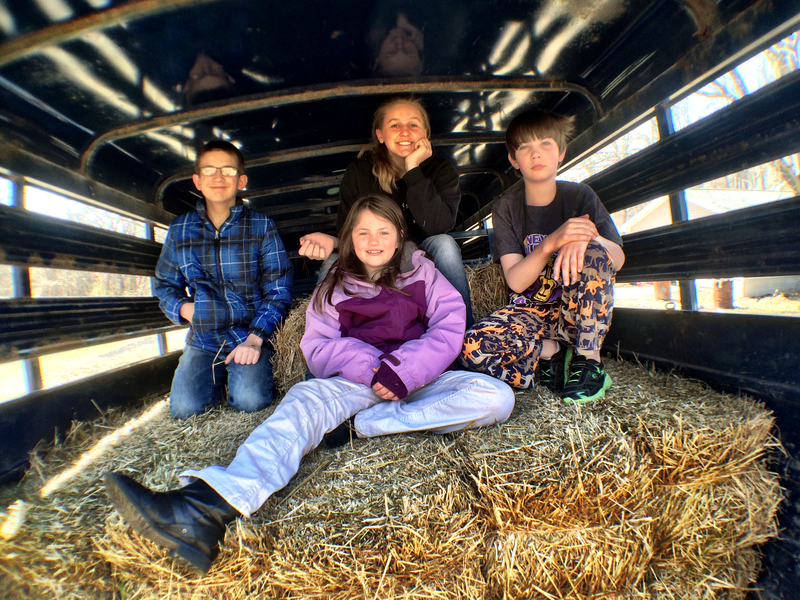 The morning began with donuts and chocolate milk (as every Saturday with the kids does), after which we hooked up the trailer to the Yukon and proceeded to the local farm to pick up the 22 bales of straw. Gratitude to Jodi and Russ for letting us borrow the covered horse trailer for transport. 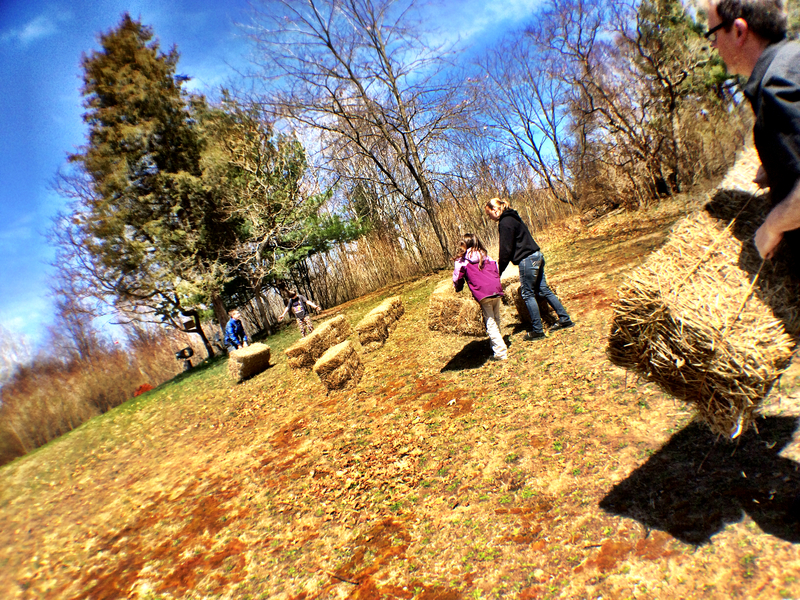 Many hand made light work, and in less than an hour, the straw bales were laid out in our desired formation. It is important to get them laid out how you want them before the conditioning process begins, because once they get saturated with water, they will be very difficult to move. We chose a simple square formation with rows that went north to south. 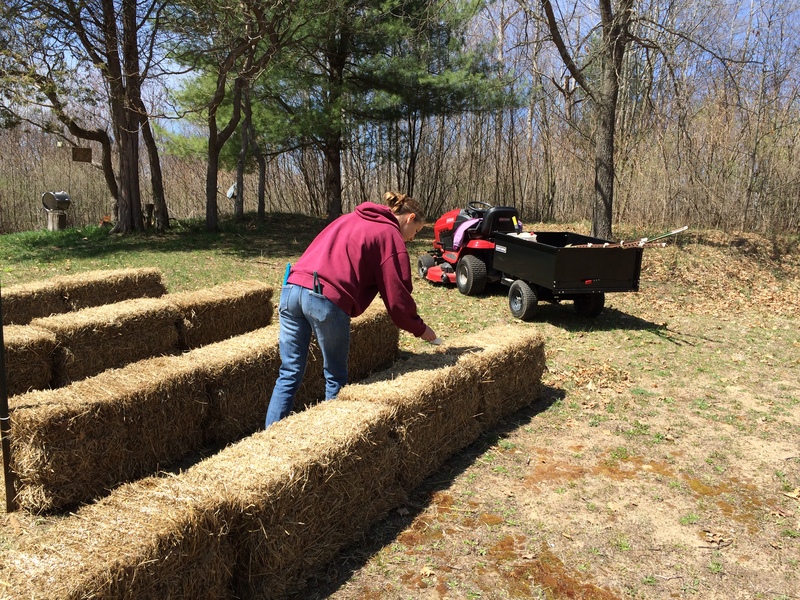 Another important step to the process is to make sure that the ‘cut side’ of the straw bale is up. You’ll know what this looks like when you see it. In a couple of weeks, we will be planting seeds into these bales, and the ‘cut side’ up is going to provide the path of least resistance for the roots to find their way down. Our research uncovered that their are many different variations to the same process of conditioning the bales. 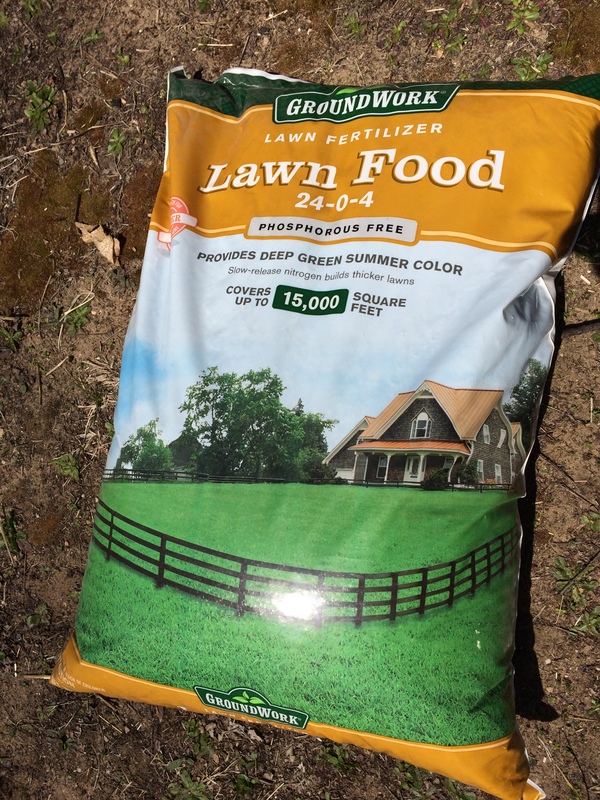 Some folks go the organic route in choosing their source of Nitrogen… others grab a bag of 24-0-2 fertilizer from their local store… Some folks only water the bales for three days before adding Nitrogen… others get the Nitrogen on right away. 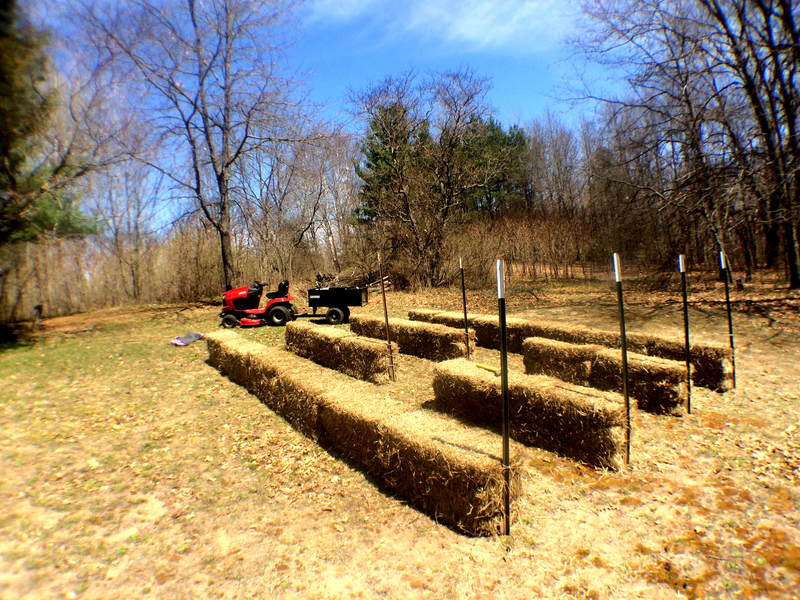 Day 1: Add 1/2 cup of fertilizer to each bale, and soak it with water. Day 2: Only water the bale. Day 3: Add 1/2 cup of fertilizer to each bale, and soak it with water. Day 4: Only water the bale. 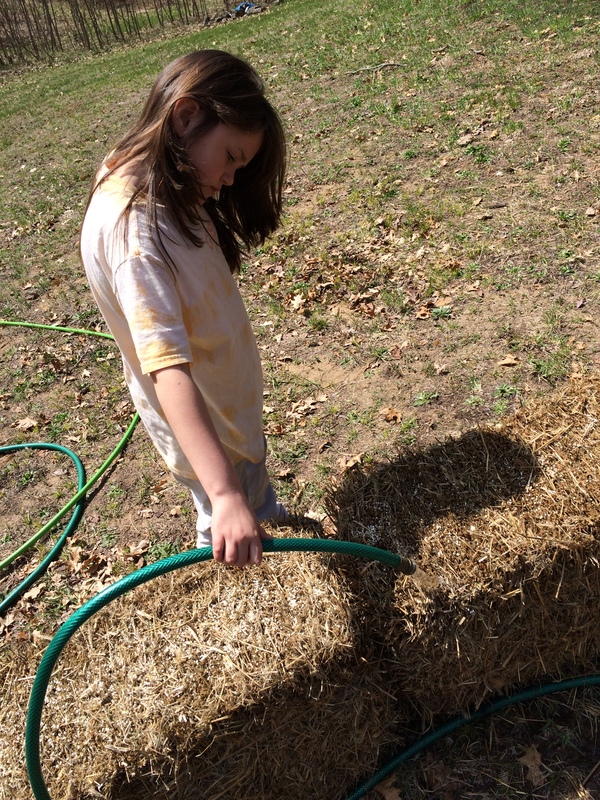 Day 5: Add 1/2 cup of fertilizer to each bale, and soak it with water. Day 6: Only water the bale. Days 7-10: Add 1/4 cup of fertilizer to each bale, and soak it with water. Days 11-14: Only water the bale until it is ready to plant. At this point, we are going to just need to see what happens… time, and fertilizer, and water will tell. We will keep documenting and updating what we see in the conditioning and break down process of the bales.